The “melting pot” is one of the strongest images of America’s appropriation of diversity, melting differences into something new. The term has caught the imagination of Americans for decades, while also generating a significant critique from those who argue that the image sacrifices differences to uniformity. 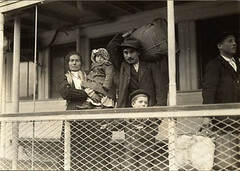 Its popularity surfaced during the massive migration of Europeans to America between 1880s and 1910. 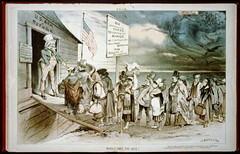 This was the largest movement of peoples in history, bringing to America a new religious and ethnic diversity on such a scale that it challenged oldtimers and newcomers alike to rethink what it meant to be “American.” Originally, the motto of the republic, E Pluribus Unum, “Out of Many, One,” had described the bonding of the many colonies into one federal union. Now it became a new challenge: the bonding of one people out of many immigrant ethnicities and nationalities. 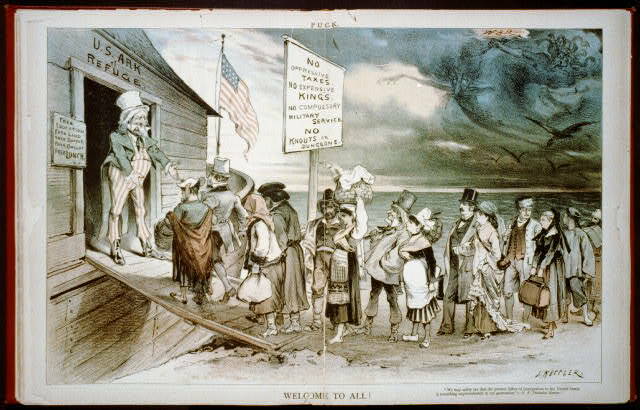 More than a hundred years before the great immigration of the late nineteenth and early twentieth century, a French essayist had described America’s “new race” of people in language that prefigured the melting pot. In Letters from an American Farmer, Hector St. John de Crevecoeur described with astonishment the man whose grandfather was English, whose wife was Dutch, and whose son married a French woman. This, he says, is the American: “Here individuals of all nations are melted into a new race of men whose labours and posterity will one day cause great changes in the world.” He envisioned the melting away of divisive differences in religion too, as Catholics, German Lutherans, and Dutch Reformed farmers were now neighbors, not rivals. His book, though published in 1782, gave future generations much to think about as they grappled with the issues of difference in American society. But David’s optimism is tested when he falls in love with Vera, a Russian who is also a Christian. His more traditional and pragmatic Jewish relatives are appalled that he would consider marrying a non-Jew, and Vera’s family is horrified that she would consider marrying a Jew. The tension becomes a living nightmare when David and Vera discover that her father was the same Russian officer who supervised the pogrom in which David’s family was massacred. Can they really leave all this behind, all these old hatreds? Can they cross over the “rivers of blood,” as Zangwill wrote, that would separate them? Finally they do, but not without being challenged to the depths by the vision of the melting pot. When Theodore Roosevelt saw the play on its opening night in Washington D.C., he said, “We Americans are children of the crucible.” Zangwill’s play thrust the image of the melting pot into public view in the midst of a record-setting decade of immigration. The image has come to bear many meanings of American identity. At its most static, it has meant the melting away of the customs and ways of the “old country” to conform with the new. Here the cartoons of the Detroit’s Ford Motor Company’s “English School Melting Pot” come to mind: Immigrants in their national costumes find themselves on the wheel of change, dipped into the melting pot and only to emerge as real Americans, wearing house dresses and business suits and carrying American flags. In this vision, having a share in America means shedding particularity. It is also important to note what is missing from this vision of the melting pot. There were no African Americans, no Cherokee, no Chinese in the crucible of America as the image came to be used and popularized. Zangwill never imagined Asians as part of the melting pot where the “races of Europe” were being refined and reshaped into a new race. And in neither Crevecoeur nor Zangwill is there mention of Native Americans as having a role in creating the new stock of people in the new world. And, as Nathan Glazer has pointed out, there is also no mention of blacks when the melting pot image is invoked, or when it is criticized by the advocates of cultural pluralism. Religion was one area where blending had its limits. In the 1940s sociologist Will Herberg proposed a modification of the idea, the so-called “triple melting pot” theory. He claimed that while ethnic differences could—and often did—melt away in the fire of the crucible, fundamental religious differences simply did not melt. There were really three different melting pots in America, he argued: Protestant, Catholic, and Jewish. He referred to the research of Ruby Jo Kennedy on immigrant marriage patterns which found that, on the whole, Protestants tended to marry Protestants, whether German or Swedish in origin; Catholics tended to marry Catholics, whether Irish or Polish; and Jews tended to marry Jews, whether Orthodox or Reform. A decade after Herberg’s claim, students of American culture began to question the “triple melting pot” as well. Nathan Glazer and future U.S. senator Daniel Patrick Moynihan published a book about the new assertion of ethnicity called Beyond the Melting Pot (1963), while Michael Novak published The Rise of the Unmeltable Ethnics (1972). In the 1970s, with the new Muslim, Sikh, Hindu, and Buddhist immigration, the question of the melting pot was raised once again. In the early 1990s, a Time magazine cover story on America’s new ethnic diversity was titled, “Beyond the Melting Pot.” It cited the Census Bureau statistics from the 1990 Census: one in four Americans was non-white—either Hispanic, African American, Native American, or Asian and Pacific Islander. Those numbers have only increased in the first decade of the twenty-first century. Between 2000 and 2010, the growth in the Hispanic population accounted for more than half of the total growth of the U.S. population and during that same time Asians saw the largest increase by a single group identifying with one race, with an increase of 43 percent. The implications for America’s religious traditions follow. Although data on religious affiliations is not captured by the United States Census, the Pew Forum on Religion and Public Life in 2008 released the results of a landmark “U.S. Religious Landscape Survey” which offers a state by state snapshot of religious affiliation. The questions of the first two decades of the twentieth century are on the agenda once again. What is the process by which people of diverse cultural backgrounds become Americans? How does it occur? How much will Vietnamese, Thai, Tamil or Pakistani culture begin to melt? Will Buddhist, Hindu or Muslim identity fade or become stronger in the American context? Will religious identity prevail over ethnicity and produce, once again, multiple melting pots—Hindu, Muslim, Jain? These are the questions a new generation now brings to the critique of the melting pot. As a Jewish immigrant who had seen the worst of the pogroms against Jews in Russia, David Quixano, the main character of the play, has tremendous faith in America, his new land. He sees America as a place where the religious, national, and ethnic differences that had torn Europe apart can be overcome. Throughout the play, David, who is a composer, articulates his vision of America as a crucible or “melting pot.” When he meets Vera Revendal, a young Russian settlement house worker who is Christian, difficult issues of identity and prejudice arise as the two are attracted to one another, as can be seen in the excerpt here. Vera: So your music finds inspiration in America? David: Yes, in the seething of the Crucible. Vera: The Crucible? I don’t understand! David: Not understand! You, the Spirit of the Settlement! Now understand that America is God’s Crucible, the great Melting-Pot where all the races of Europe are melting and re-forming! Here you stand, good folk, think I, When I see them at Ellis Island, here you stand [graphically illustrating it at the table] in your fifty groups, with your fifty languages and histories, and your fifty blood hatreds and rivalries. But you won’t be long like that, brothers, for these are the fires of God you’ve come to—these are the fires of God. A fig for your feuds and vendettas! Germans and Frenchmen, Irishmen and Englishmen, Jews and Russians—into the Crucible with you all! God is making the American. As much as Zangwill wanted to communicate the creation of a single American identity, his characters also struggle with the difficulties of overcoming both ethnic identity and the prejudice of others. Here Mendel, David’s uncle, astonished to hear David say he will marry Vera, points out the importance of maintaining a Jewish identity. Mendel: This is true? This is not some stupid Purim joke? David: True and sacred as the sunrise. Mendel: But you are a Jew! Mendel: If she was the daughter of fifty barons, you cannot marry her. David: [In pained amazement] Uncle! [slowly] Then you hankering after the synagogue was serious after all. Mendel: It is not so much the synagogue—it its the call of our blood through immemorial generations. David: You say that! You who have come to the heart of the Crucible, where the roaring fires of God are fusing our race with all the others. Mendel [Passionately]: Not our race, not your race and mine. David: What immunity has our race? [Meditatively] The pride and the prejudice, the dreams and the sacrifices, the traditions and the superstitions, the fasts and the feasts, things noble and things sordid—they must fall into the Crucible. Mendel [With prophetic fury]: The Jew has been tried in a thousand fires and only tempered and annealed. David: Fires of hate, not fires of love. That is what melts.